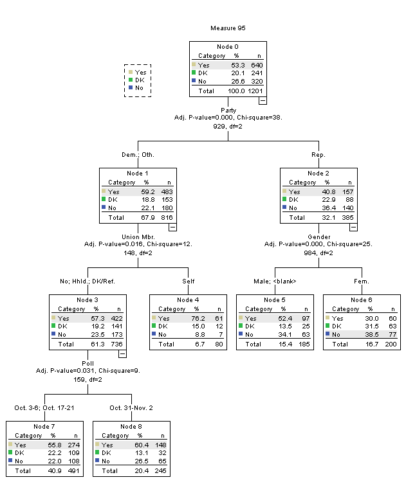 This analysis is particularly interesting because it shows the impact of campaigns. Clark, Farr, and Sorenson ran in the May primary. Their name familiarity increased because of this. However, once the campaigns were done, their name familiarity dropped. They were no longer in the public eye. 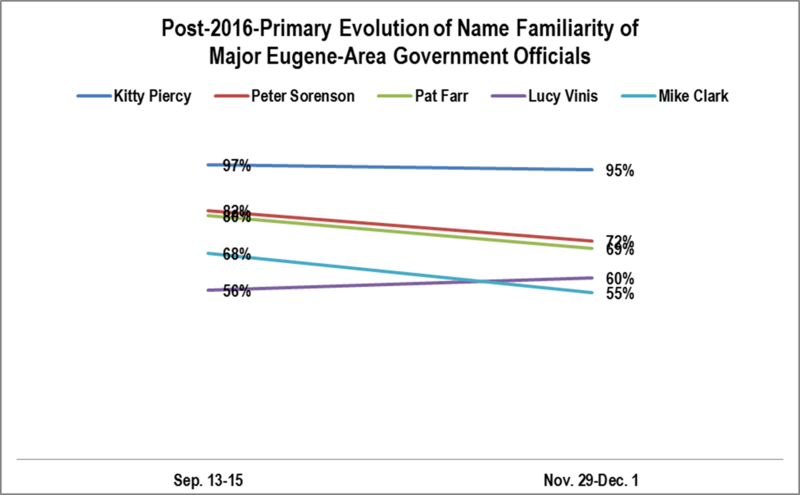 Piercy was mayor throughout the period and not on the ballot. This explains her consistency. 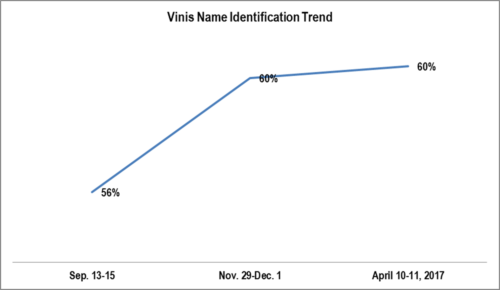 Vinis remained constant because she was preparing to become Mayor in January 2017. Emily Semple’s name familiarity appears also to have been affected by her campaign lasting until November (see http://lindholmcompanyblog.com/?p=13965). 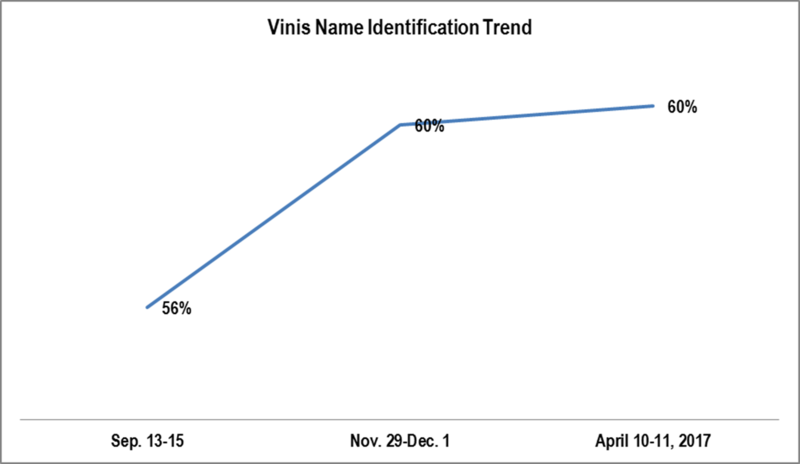 One way of seeing how low Mayor Vinis’ name familiarity is, is to compare her with the city councilors. Two, Betty Taylor and Mike Clark, are higher. Emily Semple is reasonably close. 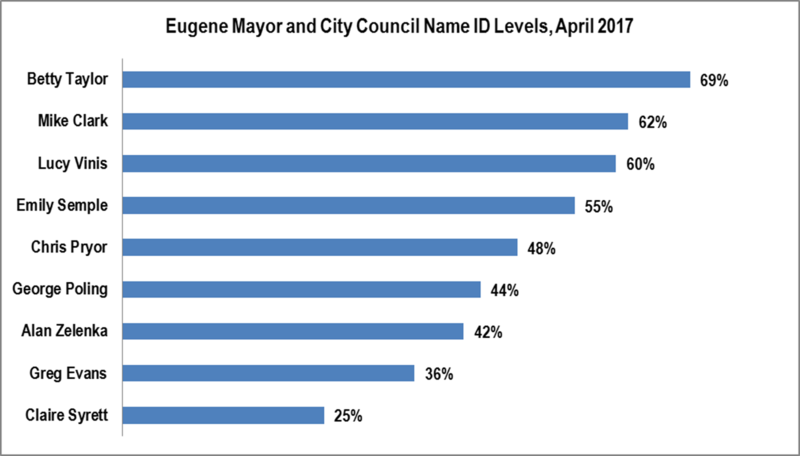 A mayor’s name familiarity should be much higher. Historically, it is generally in the 90s in Eugene. N.B. George Poling’s resignation from the council was effective the first day of survey interviewing. The turnout in the West Lane district was significantly higher than in any other district. 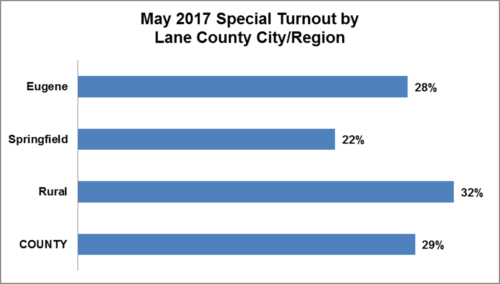 Springfield, as usual, has the lowest turnout due to its demographic profile. As noted earlier the turnout for this election was low. This blog will present a series of posts exploring this topic; along with looking at the election results by region once the precinct returns are out. 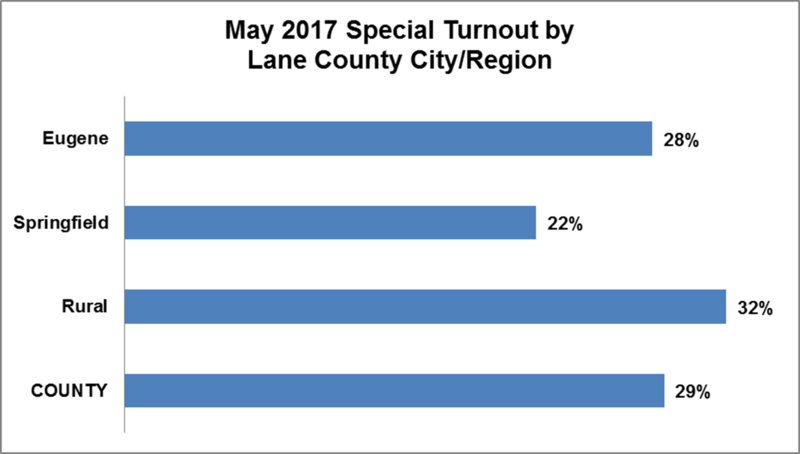 As is typical, Springfield had the lowest turnout. This is what one would expect based on the demographics. 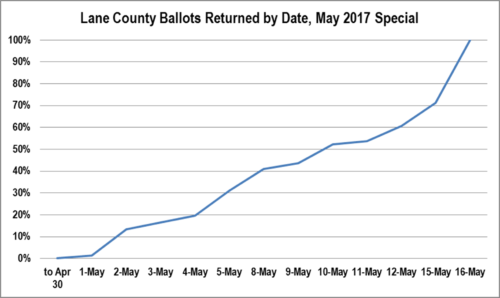 An interesting hint, however, comes from the slightly higher turnout among rural voters than Eugene voters. The primary determinant on Measure 95 voting was political party. Other important variables include gender, union membership, and date. If the election were held today on Measure 95 Amends Constitution: Allows investments in equities by public universities to reduce financial risk and increase investments to benefit students, would you vote yes or no? 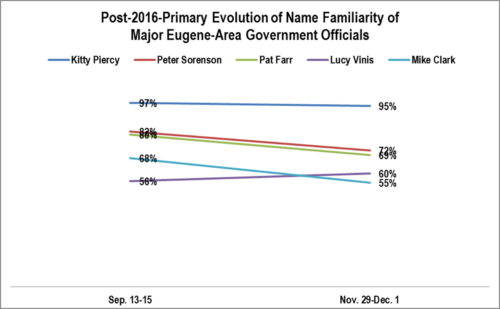 Despite being mayor-elect for nearly a year, Mayor Lucy Vinis’ name familiarity has barely budged since the campaign ended. QUESTION: Now, I am going to read the names of some people and organizations. Please tell me whether you have heard of each: Lucy Vinis? METHODOLOGY: 200 live telephone interviews of City of Eugene likely General Election voters were conducted each of September 13-15, 2016, December 2-3, 2016, and April 10-11, 2017. The margin of error at the sample median for each is 7%. 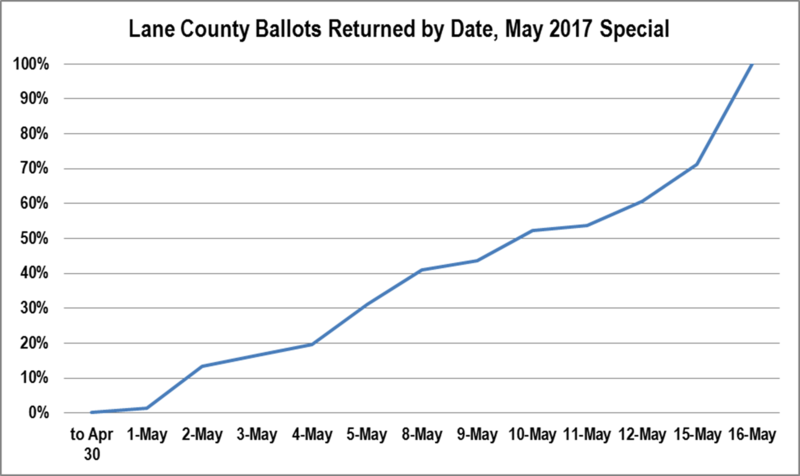 As is common in special elections, ballot come in steadily with a definite spike on the final two days. 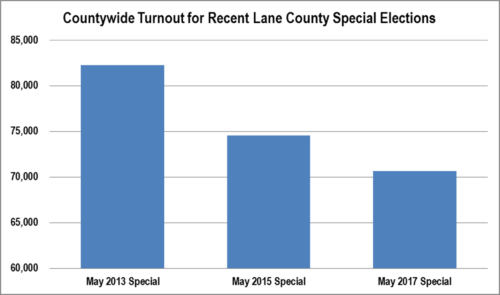 One interesting pattern is the dropping number of voters in May Special Elections. Both an expanding overall population and more expansive voter registration laws would seem imply the number of voters should be going up not down. Historically, more voters, about double, turn out in local special elections when money measures are on the ballot. The Jail Levy renewal campaign won with an astounding 73%. Recent county campaigns have been all over the map. The renewal campaign more than doubled the vehicle registration fee percentage. 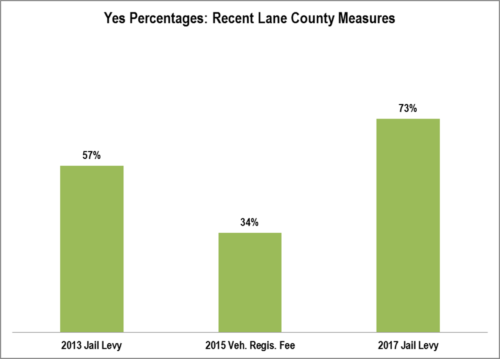 There is a clear difference in voters’ minds between the jail levy and the vehicle registration fee – not all Lane County money measures are created equal. 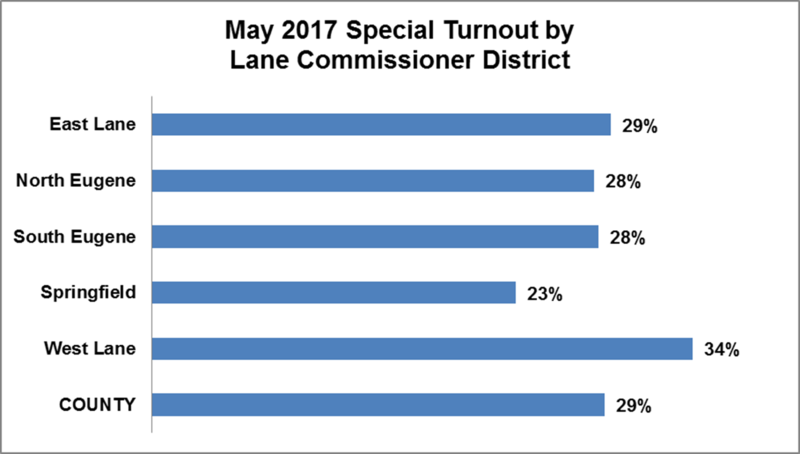 This blog will start tomorrow to post analysis of the 2017 May Special Election. The primary focus will be on countywide results and the recent jail levy, but other topics will be covered. Posts will continue regularly on Mondays. Occasionally, posts will be made on weekends.